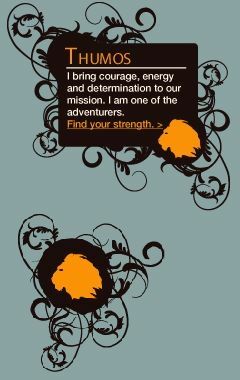 I bring courage, energy and determination to our mission. I am one of the adventurers. Thumos, you're our natural born labyrinth runners. So we need you to start practicing the lost sport now! You don't need to wait to get a team together to start training. You can lay out the labyrinth pattern or chalk it on the pavement, and start running it with your eyes open. Let your muscle memory kick into action. Soon you'll be be able to run the pattern blindfolded at the training events -- and eventually, during our synchronized competitions! Catch up on the rules of the Lost Sport. Eli Hunt warned us to be careful in his confession. And the first chapter of The Lost Ring Codex warns of potential dangers. But what do these warnings really mean? What, EXACTLY, could go wrong? Not everyone has the guts to imagine the worst. But you do, Thumos. So lay it out for us. Thumos, your strength can help us solve a mystery. So far, no one knows what happened to the artifact hidden in Casa Manuel in Bruxelles. The omphaputer says someone entered the recovery code at least once. But who? And why haven't they shared the code with me, or any of our friends? Is the artifact even really gone? I really, really want to see the next chapter. We can't just forget about this artifact! If someone took it, we need to know who. And if it's still there, we need to go get it! Can you organize and lead this investigation? This page was last modified 22:06, 21 July 2008.